Nothing on this page may be duplicated or used without permission.Total credit goes to Neoboy.Thanks for sharing it with other Nomi fans!The artwork seen below is NOT for sale. As Neoboy was kind enough to sent me "exclusive" Nomi material I like to put his work on this page. 1990,Construction,17 3/4 by 14 by 4 inches. 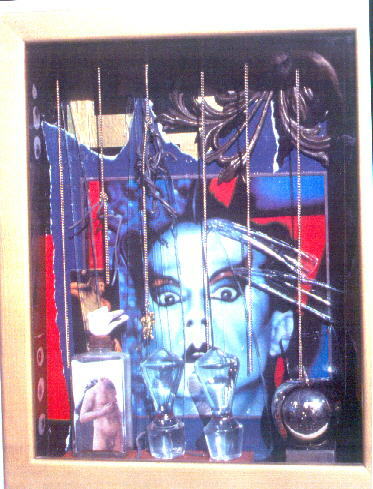 Klaus Nomi was one of my biggest heroes even before he died of AIDS in 1983.I was part of a show here in Albuquerque called Artists Respond To AIDS. I decided to do a portrait of Nomi.The piece has shattered glass over his face because I think his life was shattered pretty early on by AIDS.